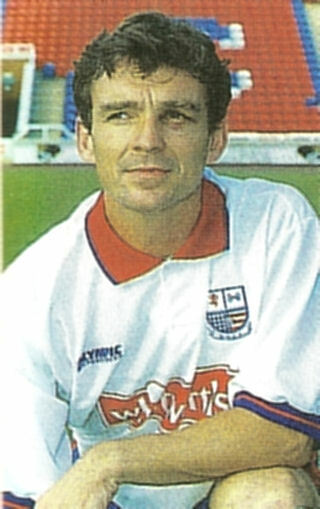 Defender Danny O’Shea joined the Diamonds prior to the start of the 1997 / 1998 season, but he had to wait until November for his Diamonds debut due to injury. A veteran from the Football League, he made nine starting appearances in the old First Division for Arsenal in 1982 & 1983, before a brief loan spell with Charlton Athletic. On his release in 1983, he played for Exeter City, Southend United, Cambridge United and Northampton Town, making some 450 league appearances, before joining Diamonds. He made just two appearances, the first in the 1-3 defeat at Morecambe. After going on loan to Aylesbury United on 19 December 1997, he returned after a month to make a substitute appearance in the Hillier Senior Cup defeat against Raunds Town. He was released in May 1998 and played for Canvey Island and Hornchurch before finishing his playing career. He has also assisted Vik Akers for a time at Arsenal Ladies FC. He is thought to have emigrated to Australia.